A quick and easy tutorial on how to make these stunning candied hazelnuts. How stunning are these candied hazelnuts?? 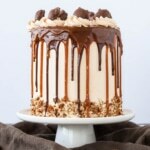 Coated in caramel and so striking, you wouldn’t believe that they are easy to make, but they are! 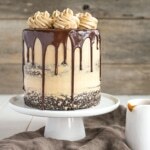 I made these to top a Nutella Hazelnut cake (pictured) for a recent dinner with friends. Here’s a quick and easy (I promise) tutorial on how to make your own. ➤ Preheat oven to 350F. Spread hazelnuts on parchment lined baking sheet. Bake for approx. 5-8 minutes, or until fragrant. To remove skins, wrap warm hazelnuts in a dish towel and let sit for 5-10 mins. Rub vigorously in towel to remove skins. You’ll need to devote a bit of space in your kitchen to make the candied hazelnuts, ideally a low traffic area, or an area that you can cordon off from kids/pets/SO’s. You’ll need a heavy cutting board or marble slab, or something similar (and heavy) that you can place skewers under. I like to place a couple skewers under there right away to prop the board up. On the floor you’ll need a sheet pan lined with parchment to catch the drippings. Once that’s set up, get your sugar and water cooking on the stove. 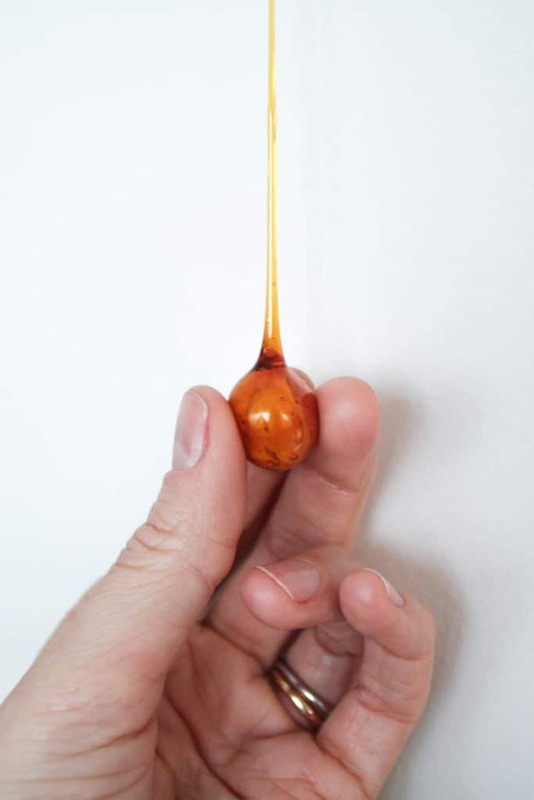 While that’s going, stick the tip of a skewer into each hazelnut. Don’t press too hard or try to push it in too far, as the hazelnut will break. If this happens, just grab another hazelnut and move on! Once the caramel has reached the desired color (approx. 10mins), shock the pot in some very cold water to stop the cooking. Let the caramel thicken up a bit before dipping the hazelnuts in. 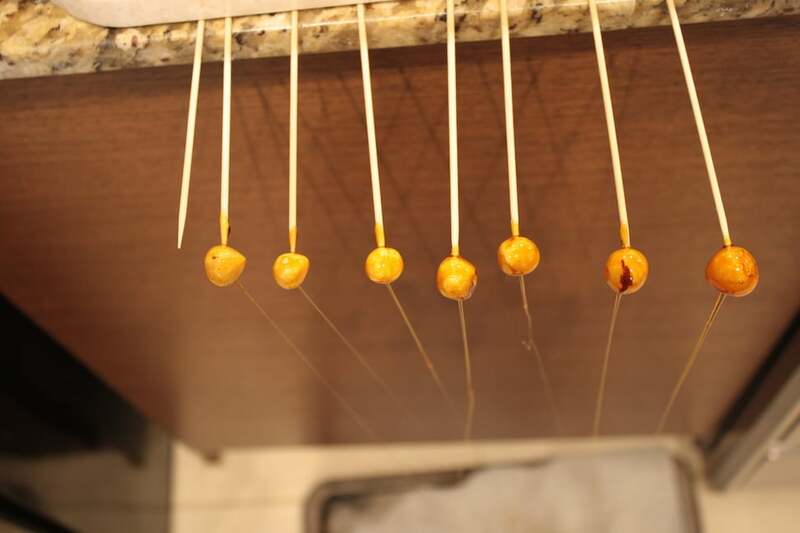 Once your caramel is ready, dip each hazelnut in separately, then immediately slip the skewer under your cutting board. 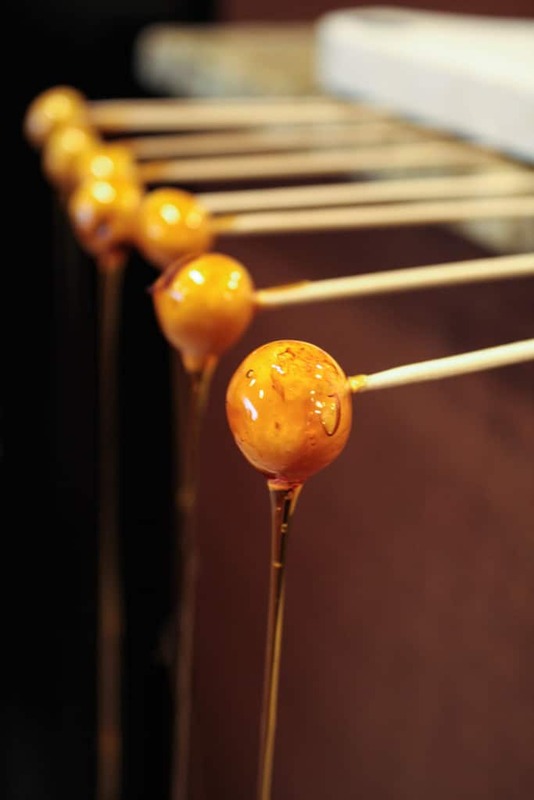 Be sure to space the skewers apart, as the caramel strands will tend to stick to each other (see pic below). I hold the pot over/near the sheet pan so that I don’t drip caramel everywhere. 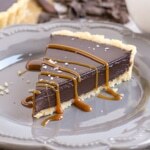 If you dip a hazelnut in and a caramel strand isn’t forming, the caramel needs more time to thicken up. You can see in the pic above: the ones on the right have a much thicker and prettier strand, as the caramel was thicker at that point. I was a little impatient with the ones on the left. 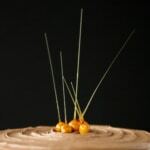 Let the caramel cool and harden, then use scissors to cut the strands to a desired length before moving the skewers. The strands are very sticky and will still stick together at this point, so trim them first, then remove each skewer from under the cutting board. 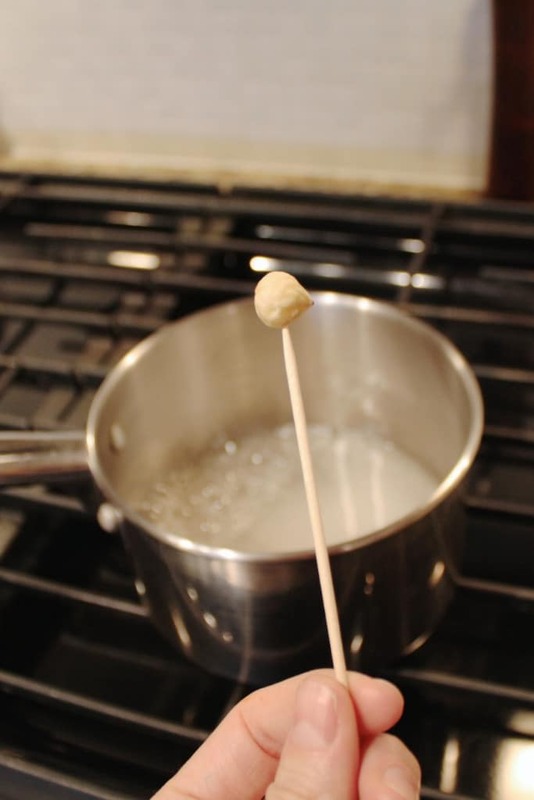 Next, gently remove the skewer from each hazelnut. It should come out easily. The caramel around the entry point may crack and flake off a bit, but that can just be the back side of the candied hazelnut. Store in a cool, dry place, spaced out on a parchment lined sheet pan. Do not cover and do not store in the fridge! You’ll want to use these guys immediately, ideally the same day, as they will not last long, especially if you live in a humid climate! 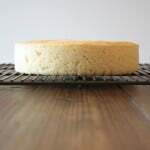 Humidity is the enemy of sugar, and these strands will dissolve away. Best to prepare only a couple hours before you need to use them. If you’d like more of a visual step-by-step process, check out Martha Stewart’s video here. 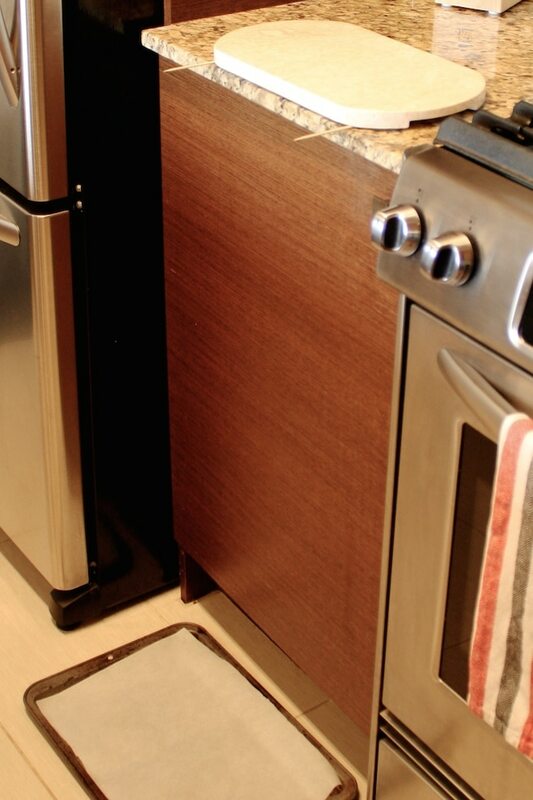 Place cutting board or marble slab on edge of counter and prop up with a couple skewers. Place sheet pan lined with parchment on ground below cutting board. Insert the tip of a skewer into the side of each hazelnut. Set aside. Place sugar and water into a small pot over med-high heat. Stir only to combine. Wash down the sides of the pot with some water and a pastry brush to prevent sugar from crystallizing. Do this from time to time, as needed, while the sugar is cooking. Continue to cook sugar until the caramel reaches desired color. Do not stir at any point. Shock pot in a bowl of ice water to stop cooking. Let caramel sit in pot for a minute or two until it starts to thicken. 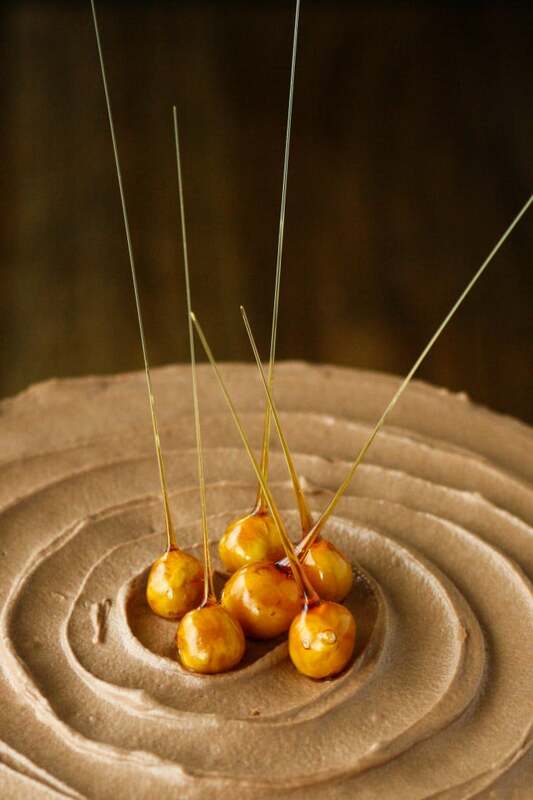 Dip a skewered hazelnut into the caramel, if a strand forms, caramel is ready. If not, let caramel sit for a bit longer. Carefully slide the end of each skewer under the cutting board and let sit until cooled. 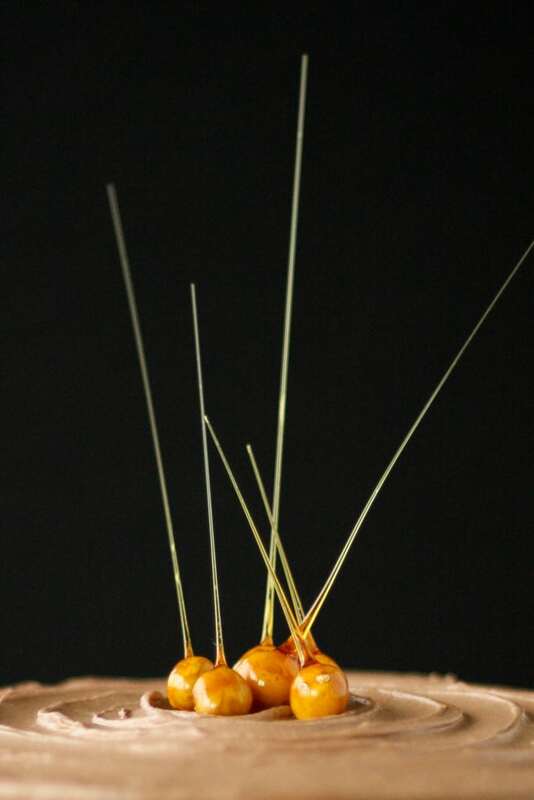 Do not place skewers too close together as caramel strands will stick to each other. Cut strands to desired length. Carefully remove each hazelnut from the skewer. Store in a cool, dry place spaced out on a parchment lined sheet pan. Do not cover and do not store in the fridge! Use same day. If your caramel gets too thick, put it back on the stove to heat it up. 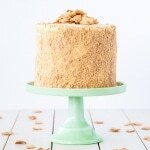 can I make the hazelnuts with coconut sugar ? Hi Romi! 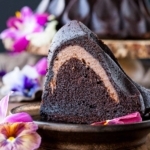 I’ve never uses coconut sugar before — does it caramelize like normal sugar? 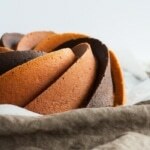 could i make these and just sort of lie them on parchment instead of doing the string thing? Hi Danielle! You could do that for sure, but the excess caramel would pool under the hazelnuts. Wow, they look so incredible. Thanks for the tutorial, it’s really easy to follow and there are a lot of interesting tips.Pinned! Thanks Azu! Glad you found it helpful :). Wow that looks so impressive! Have to try it!